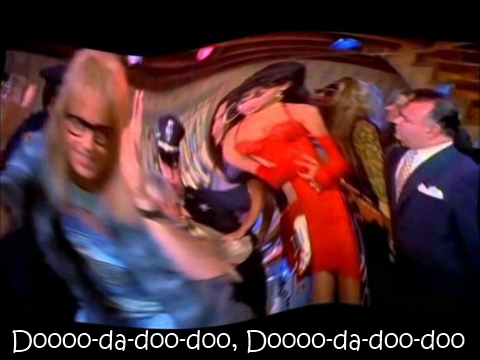 "...Where The Cheapshot Artist Capitals Hit the Ice"
First, I borrowed this Doo-Doo-Doo Time Travel device from my buddies Garth and Wayne, and I'm going to use it to bring the Penguins' fan base back to similar moments in our playoff history. While there, we'll look at the dirty plays committed against Pittsburgh, examine how the Penguins responded within those series, and then enjoy the (SPOILER ALERT) Stanley Cup that came at the end of the run. Back in 1992, the Pittsburgh Penguins faced the New York Rangers in the second round. Graves (somewhat predictably) denied that the injury was intentional despite all of the visual evidence (see: baseball swing form above) stacked against him. The NHL agreed, and suspended Graves for several games. The injury infuriated the Penguins, who came back and won the series and then later, the Stanley Cup, by tying the NHL playoff record of 11 consecutive wins. 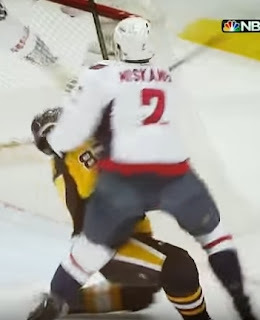 Alexander Ovechkin played the villain card this time around, kneeing the Penguins' Sergei Gonchar, hobbling the Pittsburgh defenseman until a surprise return much later in the series. Like the 1992 Penguins, the team rebounded without its team star and defeated Washington en route to the franchise's 3rd Stanley Cup, courtesy of the Detroit Red Swings in 7 games. The Pittsburgh Penguins entered last night's game up 2-0 against the heavily favorite Washington Capitals, once again led by the aforementioned Alexander Ovechkin. After a discussion, the officials levied Niskanen with a 5-minute Major Penalty for cross-checking, which comes with it a mandatory ejection. "But don't believe me...let Troy McClure tell you!" an automatic game misconduct penalty shall be imposed on the offending player." The Penguins were unable to score during the major penalty, in part because Evgeni Malkin got caught trying to (literally) juggle the puck behind the net. A series of unnecessary penalties later, Pittsburgh had given the Capitals a 5-3 power-play opportunity, and Nicklas Backstrom deflected a puck off of multiple things in front (including Fleury's stick) to give Washington a 1-0 lead. The Capitals would hold that lead late into the second period, when, having dodged a disallowed goal and a slew of excellent scoring chances (I'm looking at you, Bryan "Wide Open Net" Rust), they would double the lead to 2-0 when Evgeny Kuznetsov inexplicably had the time to wait out a sprawled Marc-Andre Fleury. Fortunately, the Penguins rallied like Paul Walker and Vin Diesel and tied the game with two super late goals with Fleury on the bench. The tying goal, scored by Justin Schultz on a shot from the point, might have elicited the loudest cheer in Consol/PPG Paints history. Unfortunately, the Capitals were (correctly) awarded another power-play, and a deflected Kevin Shattenkirk shot from the point beat Fleury cleanly, and Washington had halved its series deficit to 2-1. 2) Matt Niskanen was the Capitals' media face, repeatedly saying that the contents of the meeting were "None of anybody's business." 3) The Capitals eschewed convention and started 7 defensemen for Game 3. This odd decision became beneficial when one of the 7, the vocal Matt Niskanen, was ejected for injuring Crosby. 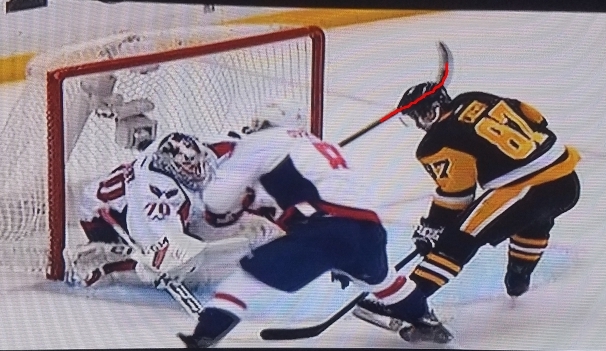 4) Both Ovechkin and Niskanen targeted Crosby's head in a span of about 1.5 seconds. I think that without question, part of the Capitals' grand game plan was to play a grittier (see: dirty) style of game and see what they could & could not get away with, as that type of gameplan shies in their direction IF the refereeing standard is any degree of lax (and it certainly was on Monday night). Long and short: if you ask me whether or not I think the Capitals deliberately tried to hurt Crosby, Malkin, etc., my answer is an emphatic no. ....but to that end, if you ask me whether or not I think the Capitals deliberately tried to NOT hurt Crosby, Malkin, etc., my answer is an emphatic NO. There was a point late in the 3rd period where Ovechkin was lying prone on the ice after taking a strong hit. The puck wound up in his feet, and the Penguins could have had more or less open season to slash and hit the Russian winger, but they very deliberately let up and made no attempt to injure or maim. That lack of a "killer instinct," a discipline that had served the Penguins well in terms of avoiding the retaliatory and unnecessary penalties that plagued the franchise from 2010-2015, also keeps them at a disadvantage when playing a team like the Capitals that– at least tonight– didn't care one iota as to whether or not they hurt someone on the Pittsburgh roster. As a fan of both the sport and the Penguins, I'm disappointed in the NHL. I'm disappointed that after 25 years of the NBA showing an example on how to promote and protect star players hasn't rubbed off on Gary Bettman. A league that allows– if not passively condones– brutal headshots to star players, is sabotaging its own potential. No Updates on #BabyWatch2017, so we'll be back to seeing how things shake out come Wednesday evening. I really kept this article at a vulgarity minimum, but yeah, Capitals fans claiming that Ovechkin didn't slash Crosby in the head really grinds my gears.